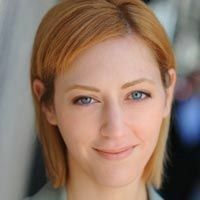 Yoga therapist and psychologist Kelly McGonigal explains how to identify the source of your chronic pain—and how restorative yoga can bring you true relief. There are few things more frustrating to a person with chronic pain than hearing someone say, “Your pain is all in your mind.” But if you’re one of the estimated 50 to 75 million Americans living with chronic pain, these words might actually be the key to relieving your suffering. Chronic pain is in the mind—but this does not mean what you think it means. The experience of pain is real. Pain has a biological basis. It’s just that the source of pain isn’t limited to where one feels it or thinks it is coming from. Modern science and yoga agree: our present pain and suffering have their roots in our past pain, trauma, stress, loss, and illness. For decades, scientists and doctors thought that pain could be caused only by damage to the structure of the body. They looked for the source of chronic pain in bulging spinal discs, muscle injuries, and infections. More recent research, however, points to a second source of chronic pain: the very real biology of your thoughts, emotions, expectations, and memories. Most chronic pain has its roots in a physical injury or illness, but it is sustained by how that initial trauma changes not just the body but also the mind-body relationship. The complexity of chronic pain is actually good news. It means that trying to fix the body with surgeries, pain medications, or physical therapy is not your only hope. By first understanding chronic pain as a mind-body experience and then using yoga’s toolbox of healing practices—including breathing exercises and restorative poses—you can find true relief from pain and begin to reclaim your life. Understanding the difference between acute pain and chronic pain will be critical to your ability to reduce and manage your pain. Let’s begin by examining the basic steps of the pain response: sensation, stress, and suffering. The protective pain response begins when the body experiences some physical threat, such as a cut, a burn, or an inflamed muscle. This threat is detected by specialized nerves and sent through the spinal cord and up to the brain where, among other things, the threat signals are transformed into pain sensations. Emotion-processing areas of the brain also get the message, triggering a wide range of reactions, from fear to anger. Combined, your thoughts and emotions about the physical sensations of pain make up the suffering component of the full pain experience. To help you take action, the threat signals have been simultaneously routed to the areas of your brain that help the body launch an emergency stress response, coordinating the actions of the nervous system, endocrine system, and immune system. The emergency stress response triggers a cascade of physiological changes that give you the energy and focus to protect yourself from life-threatening danger. Even after the threat is gone, the pain response is not over. The mind and body are very interested in making sure you know how to protect yourself from this threat in the future. So the nervous system begins the process of learning from this experience. Any kind of injury or illness, even one that is short-lived or appears to be fully healed, can change the way the nervous system processes pain. Chronic pain differs from acute pain in three important ways. First, the body can become more sensitive to threat, sending threat signals to the brain even when the threat is minor or non-existent. Second, the brain can become more likely to interpret situations as threatening and sensations as painful, producing pain responses that are out of proportion to any real danger. Finally, with repeated pain experiences, the boundaries between the many aspects of the pain response—sensation, suffering, and stress—get blurred. In most cases of chronic pain, the mind and body have learned all too well how to detect the slightest hint of a threat and mount a full protective response in all its glory. So the things that make pain so effective at helping us survive acute emergencies and handling short-term pain are the very things that make chronic pain so complex and persistent. The pain you feel may reflect a protective mind-body response that has become overprotective. Why does past pain make you more sensitive to future pain? You can thank one of the great wonders of our nervous system: its ability to learn in response to experience. This ability is called neuroplasticity. Through the repeated experience of pain, the nervous system gets better at detecting threat and producing the protective pain response. So unfortunately, in the case of chronic pain, learning from experience and getting “better” at pain paradoxically means more pain, not less. Both modern science and yoga share this idea: present pain and suffering have their roots in past pain, trauma, stress, loss, and illness. Modern science uses words like neuroplasticity to describe the process of learning from past experiences; yoga uses the word samskara. Samskaras are the memories of the body and mind that influence how we experience the present moment. Samskaras keep you stuck, feeling the same emotions, thinking the same thoughts, and even experiencing the same pain. Samskaras do not always lead to suffering—they also lead to positive change. Just as trauma, illness, pain, and stress leave traces on the body and mind, so do positive experiences. What you practice, you become. Learning is lifelong, and none of the changes you’ve learned have to be permanent. Neuroplasticity can be harnessed for healing. Your mind and body have learned how to “do” chronic pain, and your job is to teach it something new. Relaxation specifically has been shown to be healing for chronic pain. It turns off the stress response and directs the body’s energy to growth, repair, immune function, digestion, and other self-nurturing processes. The relaxation response unravels the mind-body samskaras that contribute to pain and provides the foundation for healing habits. Consistent relaxation practice teaches the mind and body how to rest in a sense of safety rather than chronic emergency. Below, we will look at a breathing practice and several restorative yoga poses that promote the relaxation response. Breathing the body is a visualization practice adapted from the traditional practice of yoga nidra (yogic sleep) and the body-scan practice taught in Jon Kabat-Zinn’s mindfulness-based stress reduction program for people with chronic pain. Start in any comfortable relaxation pose such as savasana (corpse pose). Place your hands on your belly and feel the movement of the breath. Notice the belly rising and falling, and notice the breath moving in and out of your body. Direct the breath right at the sensations of discomfort. Imagine that the breath is dissolving the tension and pain. In this practice, you will imagine that you can inhale and exhale through different parts of your body—as if your nostrils were moved to that part of the body. Start with your feet. Imagine the breath entering your body through the soles of your feet, and exiting your body through the soles of your feet. Notice any sensations there. Feel, or imagine, that flow of energy in the feet as you breathe. Now repeat this visualization for other parts of your body: Your lower legs, knees, and upper legs. Your hips, lower back, middle back, and upper back. Your belly and chest. Your shoulders, upper arms, elbows, lower arms, hands. Your neck. Your forehead and the crown of your head. When you get to an area that feels tense, uncomfortable, or painful, don’t skip it. There are several things you can try that may make you feel more comfortable. First, stay with the visualization and direct the breath right at the sensations of discomfort or pain. Imagine that the breath is dissolving or massaging the tension and pain. Imagine the solidity of the tension or pain softening. Find the space inside the pain. Second, try moving your attention back and forth between the uncomfortable area and a more comfortable area. For a few breaths, breathe into the painful area; for the next few breaths, breathe into another area. Switching back and forth like this can teach the mind how to give the uncomfortable sensations less priority. You are practicing a healthy kind of distraction: intentionally shifting your focus while still being present in your body. When you have worked your way through the whole body, let yourself feel the breath enter the body through your nose, mouth, and throat. Imagine the sensation of breathing through your whole body, as if the body were gently expanding as you inhale and contracting as you exhale. Feel, or imagine, the flow of energy through your whole body. Restorative yoga turns on the healing relaxation response by combining gentle yoga poses with conscious breathing. Below you will learn four restorative yoga poses that may be practiced on their own or in a sequence. There are several factors that make restorative yoga so relaxing. First, each pose is meant to be held for longer than a few breaths. You can stay in a restorative pose for 10 minutes or even longer. The stillness allows the body to drop even the deepest layers of tension. Second, restorative poses use props to support your body. 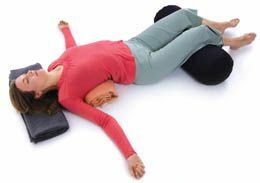 Props can include the wall, a chair, a couch, pillows, blankets, towels, or bolsters designed especially for restorative yoga practice. The right support in a pose will make it feel effortless, so your body can fully let go. You shouldn’t feel strong sensations of stretch or strength the way you might in a more active yoga pose. Stretching and strengthening, although healthy, are both forms of tension in the body. They are a kind of good stress on the body, asking the body to adapt to the challenges of a pose. But restorative yoga is all about letting go of tension and stress. The order of poses presented here is just one possible sequence. As you explore the poses, you may find that your body prefers a different sequence or that you would rather stay longer in one pose than practice several poses for shorter periods. You can also integrate restorative poses into an active yoga session. Nesting pose creates a sense of security and nurturing. It may also be a position you are comfortable sleeping in, making it an excellent posture to practice if you have insomnia or other difficulty sleeping. Lie on your side, legs bent and drawn in toward your belly. Rest your head on a pillow, and place a pillow or a bolster between your knees. Rest your arms in whatever position feels most comfortable. If available, another bolster or pillow may be placed behind your back for an extra sense of support. Rest in the natural rhythm of your breath, observing each inhalation and exhalation as it moves through the body. Take comfort in the simplicity and effortlessness of this action. This pose relaxes tension in the belly, chest, and shoulders that otherwise can restrict the breath. Lean a bolster on a block or other support (such as telephone books). Sit in front of the bolster with your legs in a diamond shape. Place a pillow or a rolled blanket under each outer thigh and knee, making sure that the legs are fully supported without a deep stretch or strain in the knees, legs, or hips. Lean back onto the bolster so that you are supported from the lower back to the back of the head. Rest your arms wherever is most comfortable. Now notice the whole front of your body relax and gently open as you inhale. Follow this sensation and feel the ease in the front of the body as you breathe. Supported backbend is a heart-opening pose that reinforces your desire to embrace life and not let challenges—including pain—separate you from life. This pose also works magic to release chronic tension in the back and shoulders, undoing postural habits that come from spending too much time at a desk, at a computer, or driving. Sitting, place a bolster or a stack of pillows or blankets under slightly bent knees. Place one folded pillow or rolled blanket or towel behind you; when you lie back, it should support the upper rib cage, not the lower back. If you need extra support underneath the lower rib cage and lower back, roll a small towel to support the natural curve of the spine. Place a rolled towel or a small blanket to support your head and neck at whatever height is most comfortable. This pose improves the flow of the breath in the upper chest, rib cage, and belly. Allow yourself to feel this movement as you inhale and exhale. Imagine breathing in and out through your heart center. Visualize the movement of breath from your heart to your lungs as you inhale, and from the lungs back out through the heart center as you exhale. This pose relaxes the hips and back, unraveling the stress of daily activities on the spine. Hugging a bolster and resting your head on its support provides a natural sense of security and comfort. Sit cross-legged on the floor. Lean forward onto the support of a sofa, a chair, or a stack of pillows, blankets, or cushions. If you have a bolster, place one end in your lap and the other end on the sofa, the chair, or the stack of support. Rest your head on whatever support is available. If you are using the bolster, you can hug it in any way that feels comfortable, turning your head to the side. Be sure that whatever support you are using is high enough and sturdy enough to support you, without creating strain in the back or hips. If you feel a strong stretch that is uncomfortable to hold, you need more support. In this pose, the belly, chest, and back all expand and contract with each breath. Feel the movement of the whole torso as you inhale and exhale. Feel your belly and chest gently press into the support of the bolster or pillows as you inhale. Let the sensation of your breath deepen the sensation of being hugged. These simple relaxation practices will lead you on the path of ending your suffering. Yoga can teach you how to focus your mind to change your experience of physical pain. It can give you back the sense of safety, control, and courage that you need to move past your experience of chronic pain. Adapted with permission by New Harbinger Publications, Inc. from Yoga for Pain Relief by Kelly McGonigal, PhD. ©2009 Kelly McGonigal.